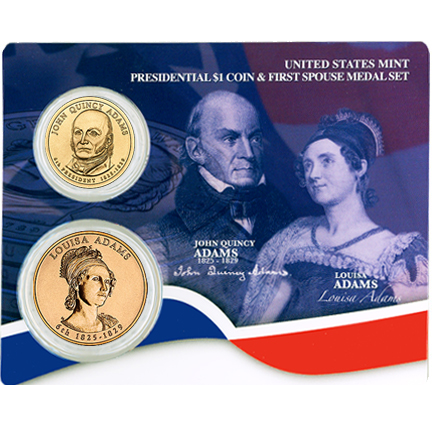 The 2008 Adams $1 Coin and Medal Set is the second of four similar sets to be issued by the US Mint in 2008 which honor the former Presidents of the United States and their spouses. Included in this particular set is an uncirculated John Quincy Adams Presidential $1 Coin as well as a bronze medal replica of the Louisa Adams First Spouse Gold Coin. Both the coin and the medal represent the sixth strike for their respective series – both of which debuted in the previous year of 2007 with strikes honoring George and Martha Washington. Both the coins and medals were authorized by the Presidential $1 Coin Act of 2005. Three of the listings shown above indicate Liberty instead of an actual person. This occurs when a President served in office without a wife. In this case, the Spouse Coins and Medals show an image of the mythical figure of Liberty instead of an actual person. The John Quincy Adams Presidential $1 Coin and the Louisa Adams Bronze Medal are each mounted on a plastic card imprinted with colorful images of both individuals. The United States Mint released the Adams Coin and Medal Set on September 3, 2008. $7.95 is listed as the release price for the Adams Set. Don Everhart has the distinction of designing and sculpting both the obverse (heads side) and reverse (tails side) of the John Quincy Adams Coin. The obverse shows a portrait of Adams while the reverse shows the Statue of Liberty. Susan Gamble designed the portrait of Louisa Adams found on the obverse of the medal. It was sculpted by Phebe Hemphill. The reverse shows Louisa and her son making a treacherous journey across Europe. It was designed and sculpted by Joseph Menna.